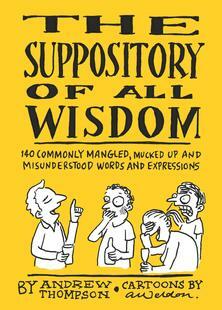 Inspired by Tony Abbott’s immortal verbal overreach, The Suppository of All Wisdom is a hilarious, fully illustrated guide to the words and expressions we most often mangle, muck up and just don’t quite understand. You’ll be amazed at how many supposably well-educated speakers make mistakes – from schoolteachers, to newsreaders, to Rhodes Scholar prime ministers. Too often the misinformed flaunt the rules, and that’s a travesty. In one foul swoop, this book will make you sound smarter. It is the ultimate grammar guide, literally awesome, and begs the question: why not buy two? With cartoons by Andrew Weldon.